Among all the libertarian writers I read regularly, Bryan Caplan is the one whose writing style I respect the most. Whatever the topic, Caplan manages to tackle it with a conciseness and rhetorical efficacy few other writers possess. Somehow Caplan always succeeds at both brevity and nuance, giving him an expository edge on the competition. 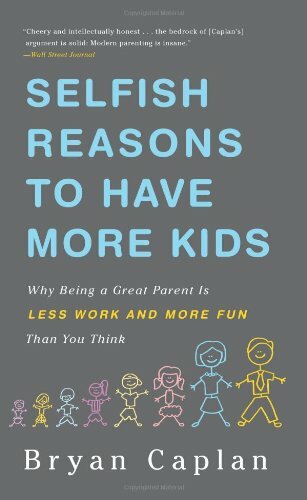 This trait is on full display in his 2012 book Selfish Reasons to Have More Kids: Why Being a Great Parent is Less Work and More Fun Than You Think. In it, Caplan makes the case that, since child rearing is not as troublesome as we all might think, each of us should have marginally more children than we otherwise might choose to do so. Caplan's arguments range from the convincing to the unpersuasive. Below, I'll discuss each one of them briefly. Let's start with Caplan's most persuasive arguments. By far the best of Caplan's arguments is the fact that the modern world is a safer and more pleasant place for children than it has ever been in human history. Caplan challenges our biases in favor of "the good old days" by extensively citing mortality and crime statistics, new technologies, and progress in general. No matter the metric, the case is pretty open-and-shut: the world is a better place for children than it used to be. If anyone holds the belief that it would be irresponsible to raise a child in such a terrible world, Caplan's rebuttal is that, however bad it might be, it's better now that it ever was - so don't let that keep you away from having kids. Caplan is equally ready to cite data in favor of the case that more kids are better for the world than fewer kids. Here he leans heavily on the theory of natalism. You don't have to be a natalist to appreciate Caplan's arguments here, though. From environmental concerns to primitive economic "fixed-pie" fallacies, he makes a strong case for the fact that any additional children you choose to have will more likely make the world a better place than a worse one. Another compelling argument in the book is that parents have a big impact on how well their children like them, even if parents don't have such a large impact on where their children end up in life. To be sure, it's an encouraging message that encourages parents to worry less, and instead focus their attention on fostering a good, loving relationship with their children. Here, though, Caplan's case isn't as strong as I'd prefer. Let's take a closer look at the less convincing arguments he makes. Caplan invests the bulk of the first part of the book citing twin and adoption studies in behavioral genetics to make the case that parents have almost no influence on how their children end up in the long run, in terms of crime, income, family composition, divorce rates, and so on. It's true that nearly all of the cases Caplan cites buttress the theory of nature over nurture, but nothing in the book is substantial enough to change anyone's mind about nature versus nurture. He too-readily dismisses nurture-based arguments by resting his entire case on a set of twin and adoption studies that all draw from the same few databases. A few days ago, I pointed out that if Caplan really believed that our genes determine the outcome of our lives, there would be no point to his writing the book in the first place. A major hole in Caplan's behavioral genetics argument is that absolutely no one disputes the fact that parents have the power to completely screw their kids up. Caplan acknowledges this fact in his book, and even makes light of it. But if he accepts this assumption, then how in the world can he dispute that parents can also greatly improve their lives. There is a vast logical inconsistency here. Why does Caplan accept that parents can have a large negative impact on children, but reject the idea that they can have a large positive impact? In answer to this, Caplan recedes into a much weaker claim: that as long as you don't thoroughly screw your kids up, they'll probably turn out fine. I have no qualms with this argument, and it is indeed convincing. But one need not take a hard-line stance in favor of behavioral genetics in order to make that point; indeed, it would probably be more convincing if he didn't. This fact is further underscored by Caplan's own experience with twins. He acknowledges that his own twins are very different people, and he attributes that difference to "free will." Yet by the very definition of "environment" he gives earlier in the book, "free will" counts as nurture. But the least-convincing of Caplan's arguments come in Chapter 9, in which he has a series of imaginary conversations with himself. In them, he plays the role of various critics and systematically refutes what he imagines to be their best claims. While I can appreciate this as a useful exercise in strengthening his case, I found the scripts to be a little weird. The idea that Bryan Caplan can defeat the arguments of imaginary people by scripting their case to fall short of his own is not very compelling evidence in favor of his claims. In fact, it captures the whole spirit of a "straw-man argument," even if it doesn't quite encapsulate a straw-man fallacy. Caplan literally imagines people who make the kind of arguments he can refute, fails to lay out their strongest arguments, and fictitiously designs the conversation such that they give up too easily. As I said, it may be a useful thought experiment for anyone hoping to improve his argument, but it is not particularly convincing for the reader, and especially not for a skeptical one. I very much enjoyed reading Selfish Reasons to Have More Kids, but if I'm being honest with myself, I must say that if I didn't already accept the conclusions of the book, I likely would not have found it interesting. This leaves me a little nonplussed. While I'd like to recommend the book on grounds that it is truly enjoyable, I likewise have to acknowledge that it won't change any minds. I'd even go so far as to say that if you already know you disagree with Bryan Caplan about having more kids, you probably won't like the book at all. So how do I finish a book review in light of these conclusions? Caplan has an easy writing style that entertains as it advocates. The conclusions he reaches in this book are, furthermore, perfectly inoffensive. How steeply can one object to babies, anyway? In that sense, it's safe to say that he's written a thoroughly entertaining book that is worth the read, so here I'll take a cue from Caplan and advocate for marginalism: If you're on the fence about reading this book, give it a shot. You'll finish it quickly and probably enjoy the prose. On the other hand, if you're skeptical of having more children and want to know the best case in favor of it, you might be better off talking to a few proud parents within your circle of friend and find out why they think kids are so great. As much as I liked Selfish Reasons to Have More Kids, it won't sway any opinions.